1 About four-in-ten adults under age 30 have student loan debt. 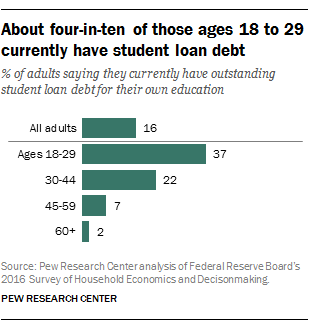 Among adults ages 18 to 29, 37% say they have outstanding student loans for their own education. (This includes those with loans currently in deferment or forbearance, but excludes credit card debt and home and other loans taken out for education.) Looking only at young adults with a bachelor’s degree or more education, the share with outstanding student debt rises to 53%. 2 The amount students owe varies widely, especially by degree attained. 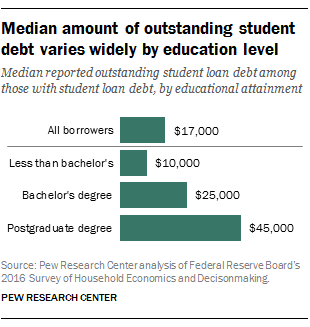 The median borrower with outstanding student loan debt for his or her own education owed $17,000 in 2016. The amount owed varies considerably, however. A quarter of borrowers with outstanding debt reported owing $7,000 or less, while another quarter owed $43,000 or more. 3 Young college graduates with student loans are more likely than those without loans to have a second job and to report struggling financially. About one-in-five employed adults ages 25 to 39 with at least a bachelor’s degree and outstanding student loans (21%) have more than one job. Those without student loan debt are roughly half as likely (11%) to hold multiple jobs. A similar relationship holds among all young adults regardless of educational attainment. 4Young college graduates with student loans are more likely to live in a higher-income family than those without a bachelor’s degree. For many young adults, student loans are a way to make an otherwise unattainable education a reality. Although these students have to borrow money to attend, the investment might make sense if it leads to higher earnings later in life. 5Compared with young adults who don’t have student debt, student loan holders are less upbeat about the value of their degree. 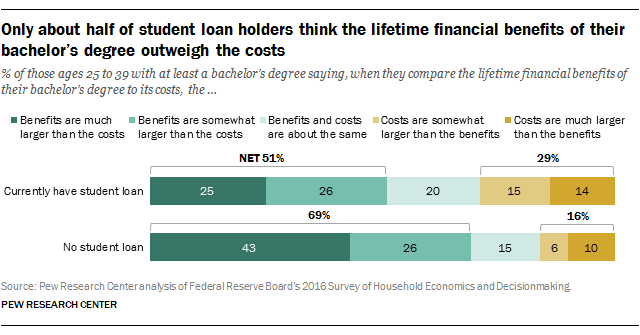 Only about half (51%) of those ages 25 to 39 with at least a bachelor’s degree and outstanding student loan debt say that the lifetime financial benefits of their degree outweigh the costs. By comparison, about seven-in-ten young college graduates without outstanding student loans (69%) say the lifetime benefits outweigh the costs.